Note: A member of the Hierarchy related to two current members of the Papal Restoration Campaign Staff, that Our Holy Father, Pope Gregory XVIII, views so called, Thuc "consecrations" as at best doubtful. Which to keep it simple, in the mind of the Church means, they never occurred. Bp. Thuc with his wildcat attempted "consecrations" was acting on his own mandate (powered by the devil). This is without dispute, as at one point he begged forgiveness from Antipope Paul VI for attempting to consecrate a group (of Alumbrados [Illuminists]) in Palmar de Troya, Spain - bishops, without a papal mandate. The Unholy Birthplace of the Novel/Sedevacantist Sect? Toulon, France. Much of Thuc's scandalous/sacrilegious acts were motivated by a desperate need of money. He admitted that he withheld his sacramental intention when conferring Sacred Orders. Note: On 10 different occasions, i.e., 10 FAKE ceremonies! Pictured above is one example of a self-admitted by Bishop Thuc himself, 100% FAKE episcopal consecration he "performed". 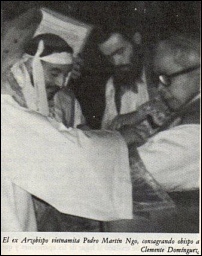 (Bishop Thuc would later formally state he was withholding his sacramental intention (a sacrilege) when "consecrating" Gomez (without a papal mandate: another sacrilege), even though Bishop Thuc had written and signed an official *document declaring that he did consecrate Clemente Dominguez y Gomez on January 1, 1976.) ??? I further certify that these Bishops and Priests pertain to the Order of the Carmelites of the Holy Face, founded in Seville on 23rd December 1975. The Mother House of this Order is at No. 20, Call Redes in Seville. The Founder and Father General is His Excellency Clemente Dominguez y Gomez, Bishop. With my own hand and pen I sign this document in order to procure all effects ecclesiastical and civil. Does the certainty of Bishop Thuc’s consecrations reach such a level as to exclude all prudent fear of error? Is the possibility that he did not validly consecrate, altogether improbable? It seems to me that no objective person possessing the use of right reason could conclude that Bishop Thuc’s consecrations were certain to the degree that they excluded all prudent fear of error, such that the opposite is reputed as altogether improbable. Catholics, therefore, must reject the validity of Bishop Thuc’s consecrations. And if we must reject Bishop Thuc’s consecrations, we of course must also reject all of the ordinations and consecrations emanating from the Thuc progeny, for the Thuc "bishops" cannot supply for what was originally wanting to the Sacrament of Orders – one cannot give to others that which they do not possess themselves. So the lack of moral certitude by which Catholics must reject the validity of Bishop Thuc’s "Orders" he "conveyed", must also be applied to Bishop Thuc’s progeny. What is the status of Bishop Pivarunas and CMRI? The True Hierarchy of the Catholic Church, currently exiled, ruled years ago that Mr. Pivarunas does not posses valid holy orders & CMRI is unequivocally schismatic. The ipso facto schismatic Fr (NON-bishop) Robert McKenna died last night outside of Catholic Church founded on St Peter (who has Perpetual Successors now & until the end of time). May us True Catholics continually thank God for the precious gift of Faith! This just shows what he really stands for. May God punish him, and may he be put away for a long time! God bless the PRC! There is a homosexual (who also claims to be a "Thuc priest") who was incensed by this post... that he has vowed to destroy the PRC. His full name may be publicly posted soon.